"Dolphins evoke the unspoiled seas for many people, and perhaps no other animal can bring the sense of enchantment and companionship to us in a wide and empty sea such as the playful, Pacific white-sided dolphin. Common in the Pacific northwest from Baja to Alaska and Japan. 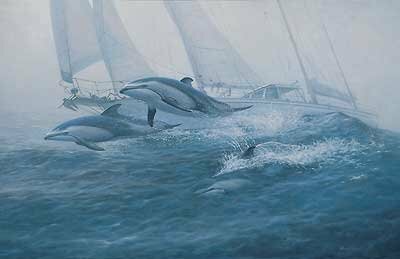 They often leap from the water, reaching extreme heights, doing anything to make a splash, and rarely pass on an opportunity to ride the bow wave of a boat, for no other reason than just to play." Image size, 17-1/2" x 27"